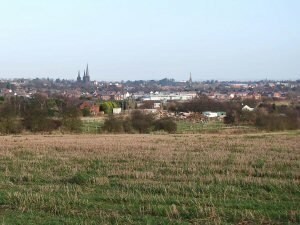 From whichever direction you approach Lichfield, its skyline is dominated by the spires of St Michaels, St Marys and most predominantly the three spires of the Cathedral, here seen over the young shoots of Winter wheat. It is the only Cathedral in the country with three spires and being on high ground to the North of the city centre, rises above all the rest. The spires of the Cathedral have dominated the countryside for hundreds of years, being known colloquially as the 'Maids of the Vale'. 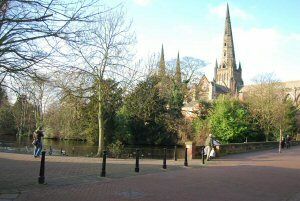 St Chad first came about 1.600 years ago, and when he died, pilgrims came to worship at the place where he had preached, and so the village, the town and finally the City of Lichfield built up around his resting place. Lichfield was important too because it lay near the junction of the Watling Street, and Rykneld Street - the Roman roads that went East to West, crossing the South to North. They met at the little village outside Lichfield proper called Wall, or Letocetum, where there are the remains of Roman settlement, including a bath house which may be visited. Later these routes became important highways for commerce and Lichfield was a great coaching stop-over place, which is why Lichfield had one of the highest number of Inns per head of population. 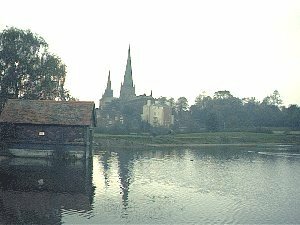 It was the coming of the railways that killed the coaching business, and what was rather sad was the reticence of the city fathers to allow the railways to come for some years, which for a while made Lichfield rather a backwater, and less of a commercial centre which it had been in the middle ages. The Cathedral is dedicated to St Chad and Saint Mary, and at least three buildings have existed on this site. 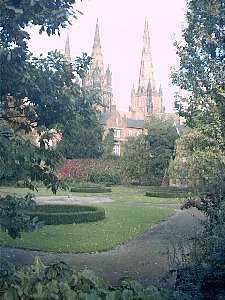 The present building dates from the re-building after the civil war, when much of it was destroyed, including the loss of the main spires. The West Elevation includes a remarkable number of carved figures of kings, queens and saints. One interesting feature of the interior is that when you stand inside with your back to the West Door, and look down the length of the Cathedral towards the Altar at the far end, you will notice that the structure takes a kink to the left at the main crossing. Apparently, when the builders came to extend the East end of the church, the foundations were not good enough, and so they had to adjust the line of the wall - but that is legend rather than fact. - There is another theory on this which says 'many churches built around that time had the chancel "lean" to the north to represent the inclination of Christ's head on the cross in symbolic fashion'. 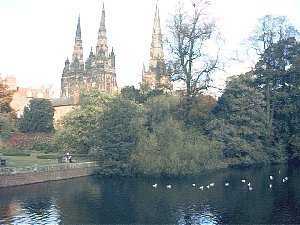 See Coventry Old Cathedral Site . For any visitor, the Cathedral, and the Close is a must, and the view at the left is from the Memorial Gardens, where once a year we remember those who fell in the Wars.